That is the most bizzare one-slot toaster I’ve ever seen. And I really want to know what Biff’s reading. I once had my toaster “eat” a bagel one morning, somehow the cage part broke and wouldnt let my bagel go, i had to disconnect the toaster and use a knife to remove my blackend bagel. Heh, I guess the toaster needs to eat every now and then Bob. Bob, i just didn’t bother turning it off first. I tripped the circuit breakers for the whole street.. 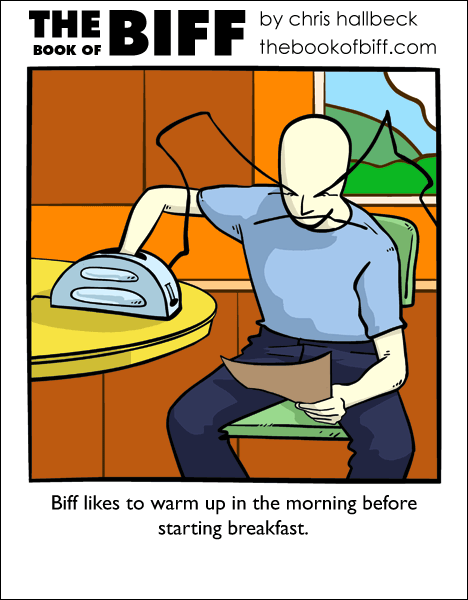 I don’t think that’s actually a toaster… it may be one of Biff’s many inventions: an electric mitten. when the cold weather appears. A friend of mine used to warm his hands over a toastie maker when he finished making them; it made his hands smell like cheese. I don’t know. It might just be me, but his head seems odd in this one. I know he’s looking down, but it looks… long. is the wire powering the toaster, or is biffs eyebrow? His eyebrow looks to be in series with the toaster. Probably a data control connection, to adjust the level of done-ness. Don’t blink, Biff, else your digits be charred! Could be an offspring of the snake-toaster. Is it just me or are the biff books on the top left and right waging an epic war.